Home / Acting Man / What Could Possibly Go Wrong? A Convocation Of Gamblers The Wall Street Journal and BloombergView have just run articles on the shadow banking system in China. This has put me in a nostalgic mood. About 35 years ago when I was living in Japan, I made a side trip to Hong Kong. 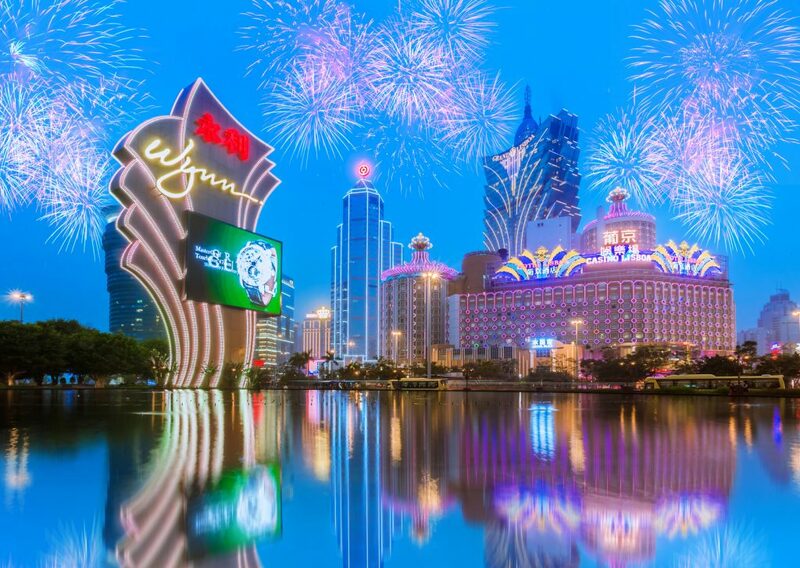 Asia’s Sin City, Macau Photo credit: Nattee Chalermtiragool I took the hydrofoil to Macau one afternoon and the same service back early the next morning. On the morning trip, I am sure that I saw many of the same faces that I saw the day before. They had been gambling all night and were now heading back, blurry eyed and hungover, to their desks in Hong Kong’s financial district. My fellow travelers now sit atop the world’s second biggest economy and a steaming pile of debt. What could possibly go wrong? Lord, Make Me Financially Prudent…But Not Yet! The WSJ article is the more detailed one. It describes the market for wealth management products (“WMP,” which is ominously and accurately close to the acronym for weapons of mass destruction). These are products sold to Chinese “investors” – remember the boat back from Macao – by Chinese banks. Monthly WMP issuance – some observers were worried about this three or four years ago already. In the meantime the WMP business has ballooned to an incredible size – click to enlarge. 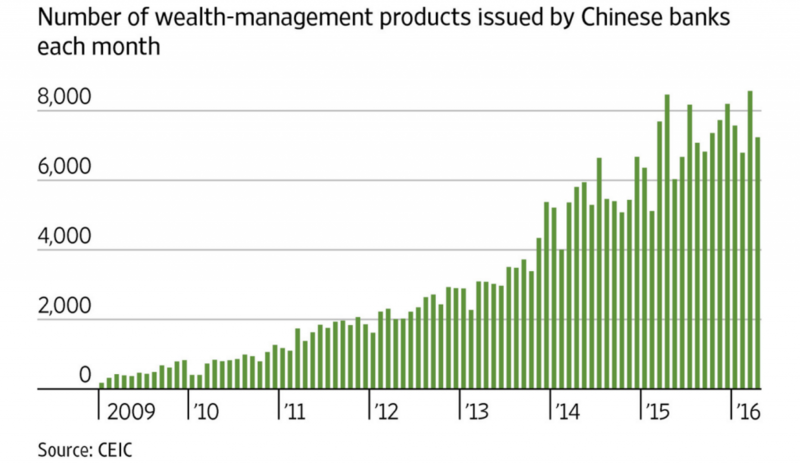 The Wall Street Journal and BloombergView have just run articles on the shadow banking system in China. This has put me in a nostalgic mood. About 35 years ago when I was living in Japan, I made a side trip to Hong Kong. I took the hydrofoil to Macau one afternoon and the same service back early the next morning. On the morning trip, I am sure that I saw many of the same faces that I saw the day before. They had been gambling all night and were now heading back, blurry eyed and hungover, to their desks in Hong Kong’s financial district. My fellow travelers now sit atop the world’s second biggest economy and a steaming pile of debt. What could possibly go wrong? Lord, Make Me Financially Prudent…But Not Yet! The WSJ article is the more detailed one. It describes the market for wealth management products (“WMP,” which is ominously and accurately close to the acronym for weapons of mass destruction). These are products sold to Chinese “investors” – remember the boat back from Macao – by Chinese banks. Monthly WMP issuance – some observers were worried about this three or four years ago already. In the meantime the WMP business has ballooned to an incredible size – click to enlarge. The former are looking to circumvent the interest rate caps on deposits and other restrictions on investment. The latter are looking to circumvent the limitations on lending and balance sheet growth. 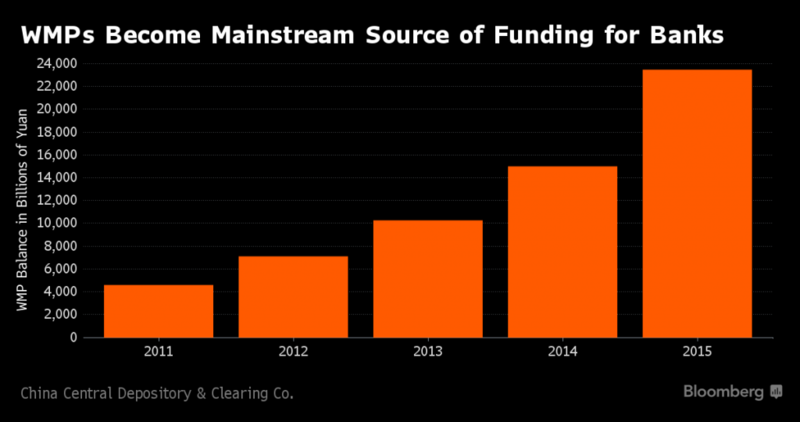 WMPs have become a major funding source for China’s banks, replacing more traditional and less risky types of funding. The maturity mismatch between WMPs and the assets they are financing is a major Achilles heel, and could eventually cause problems akin to those that arose when the US mortgage credit bubble burst in 2007-2008 – click to enlarge. WMP issuance equaled $1.1 trillion in 2015, a nearly 75% jump on the prior year and equaling 40% of the total growth in credit. Almost one-third of the WMP were bought by credit institutions for inclusion in other WMP – WMP Squared! Many of the WMP also involve leverage, often from the issuing bank, to juice the return. Over three-quarters of the WMP mature within six months, which means that they will have to be rolled over in order to continue to finance their assets, which typically have much longer maturities. WMP receivables on the books of individual banks as of year-end 2015 – to find those, one reportedly has to slog through annual reports 100ds of pages thick and read all the footnotes very carefully… – click to enlarge. 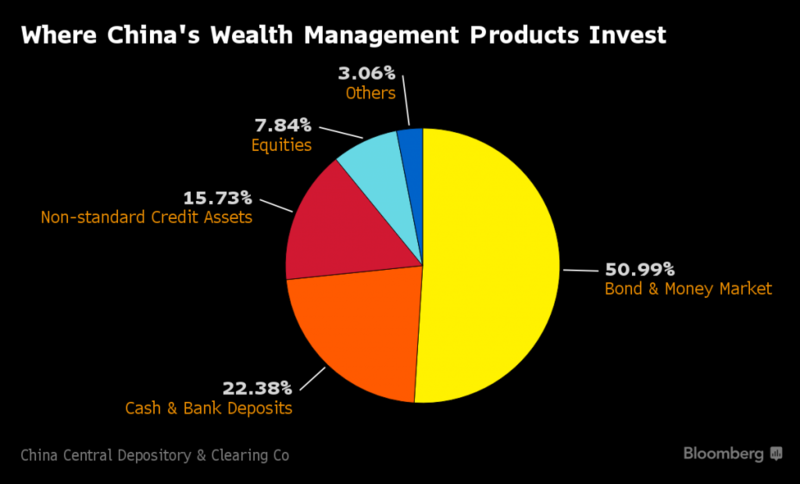 Speaking of assets, nobody really knows – or much cares – what is in the WMP, although there are loans to many loss-making sectors of the Chinese economy, which suffer from huge overcapacity and shrinking competitiveness, and a hefty participation in the booming Chinese bond market. I said that no one much cares what is in the WMP. This is because, despite warning labels that the WMP are not guaranteed, many investors think that the issuing bank – and therefore ultimately the government – is on the hook for repayment. The fact that the biggest growth is coming from small- and medium-sized banks is indirect confirmation of this. I mean, it’s not like some salesman at a small bank with a monthly quota and a mortgage would be winking and nodding with Mr. and Mrs. Joe Lee or Tom Wong, would it? Nah, that kind of stuff never happens. What WMPs are buying – note the percentages invested in bonds and “non-standard credit assets”. The bonds consist mainly corporate bonds, in which there a jaw-dropping issuance boom has taken place as well. With interest rates trending down for quite some time now, Chinese companies have eagerly loaded up on debt – often in order to finance interest payments on existing debt (corporate debt is in fact growing like weeds all over the world, driven by the same central bank policy-induced mindless demand that drove the mortgage credit bubble in the last iteration of the long boom). The problem is that the credit quality of many of the assets WMPs are buying is rather dubious, to put it mildly – click to enlarge. So we have a booming market in opaque, complicated financial instruments involving layers of risk, leverage and maturity mismatches. We have unsophisticated investors and issuers, both seeking to avoid government regulations and expecting to be bailed out in the worst case. We have cross-holdings and backdoor exposures to regular credit channels. We have all of this taking place in an environment of booming credit expansion, a deteriorating economy and financial repression. I hate to repeat myself, but really… WHAT COULD POSSIBLY GO WRONG? As an aside, why doesn’t some enterprising ETF manager come up with a product that systematically shorts whatever it is the Chinese have been manically buying? This is one of the few sure things in the financial markets. It would have done gang busters with the Chinese stock market last year and the recent wild speculation on iron ore and rebar steel. 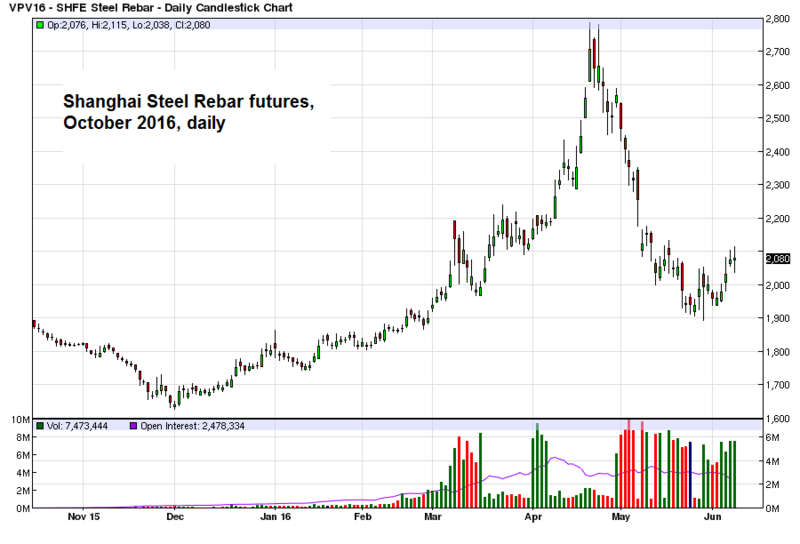 Boom and bust in steel rebar futures….note the enormous surge in trading volume – click to enlarge. Now, it could focus on bitcoins and Vancouver real estate, along with the WMP (or their sponsors). This would close the loop on the bilateral trade. We have had all the nice, cheap Chinese manufactured goods, for which we have given them pretty pieces of green paper. Now, we take the pretty green paper back. Bitcoin has lately soared again – rumor has it that Chinese investors have rediscovered their yen for BTC, so to speak… – click to enlarge. Previous Will President Trump Trigger a Recession? Will President Trump Trigger a Recession?